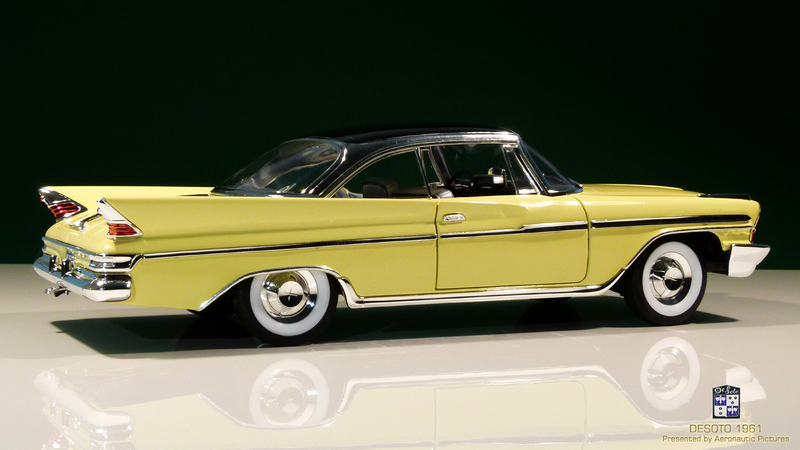 When we talk of the American cars of the fifties and sixties, I always had a soft spot for the finned cars and they had there pinnacle in the 1957-1959 period, but some manufactures kept the fins longer up to 1962. 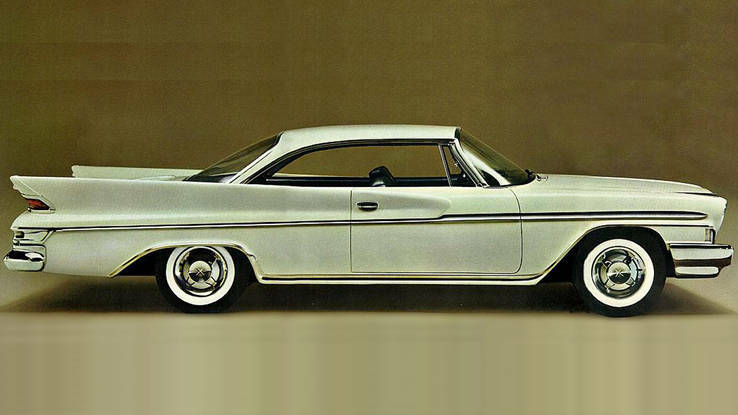 One of them is the not so known; 1961 DeSoto. DeSoto was one of the lower priced marks of the Chrysler Corporation, but in my book still manage to “look like a million” A shame this was the last year for this good looking car, but as you can read in the history section below, the reason was they competed with other marks of the Chrysler group and only 911 Coupe was made in this final year for DeSoto. 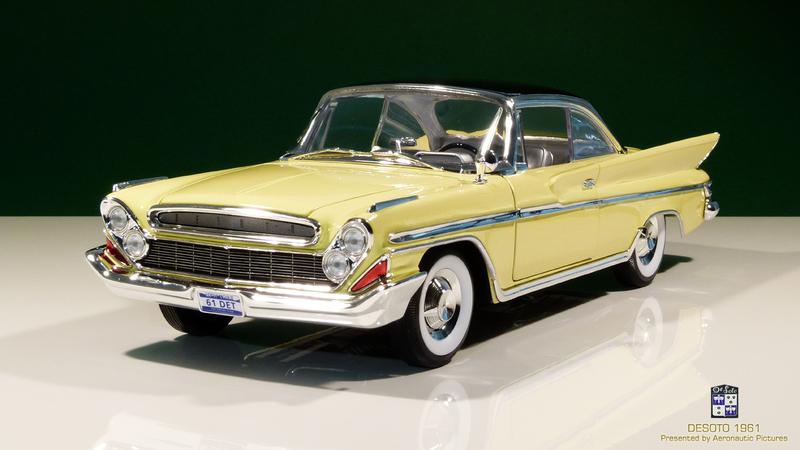 In scale 1:18 the well renown Chinese maker; Road Signature of Yatming Group have at least two batched of DeSoto, first in Mint/White or Yellow/Black and lastly in Red/Black or all Black. The first series is becoming harder to find in ordinary web shops, so I felt a bit lucky when I saw a Yellow one! 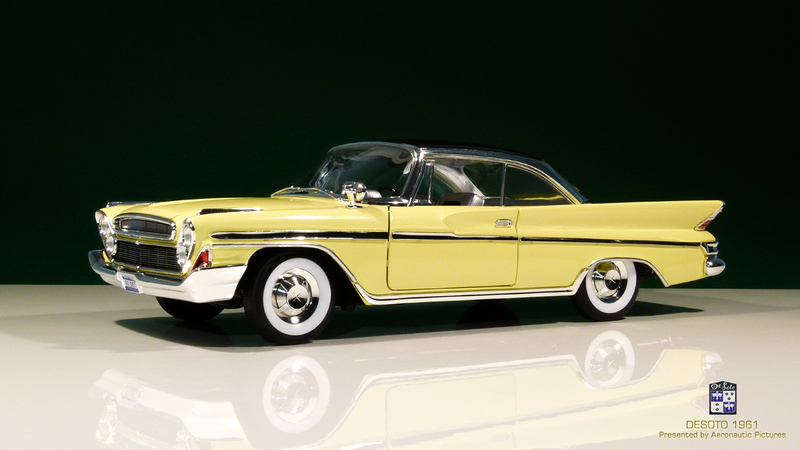 (Chrysler named the color Golden Rod Yellow). As you know by follow my reviews here. 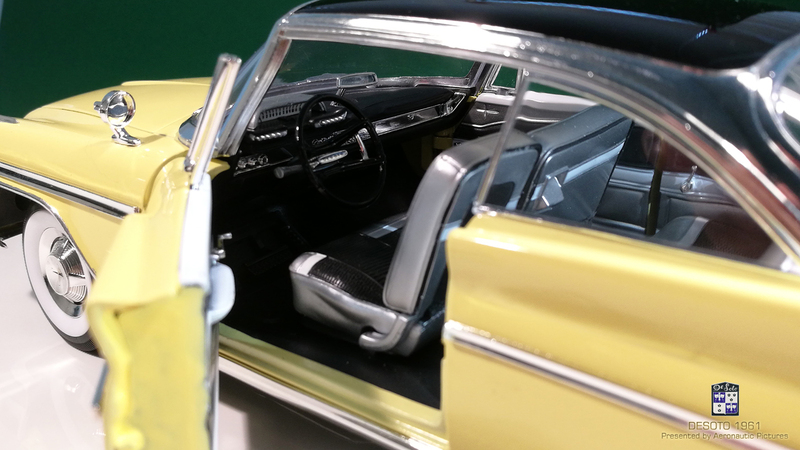 I’m quite pleased by the quality/cost of the models from Yatming, but they can vary in quality – specially the older models (some of the worst is the Corvette 57 and Impala 59) and particularly in the interior there is some bad ones. 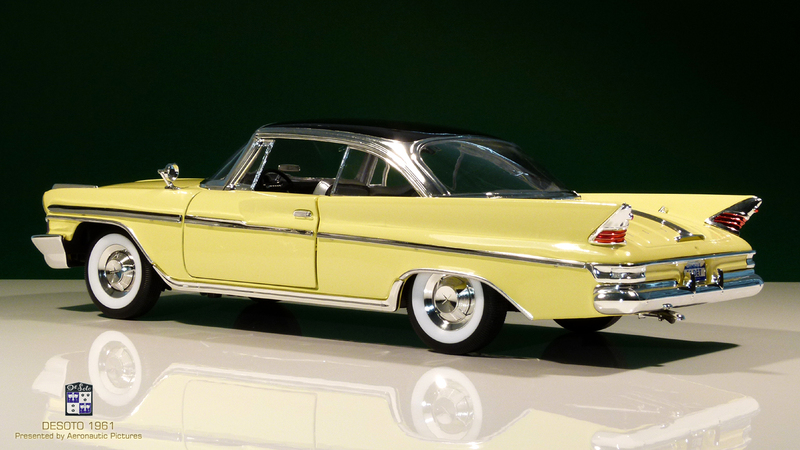 However you can be very lucky to find model cars that nearly is perfect (just look at the Packard 53 etc.) It seems to when they re-launch a model the interior gets a new look and that’s fine as the Die cast molds itself are rather good. I did not know what to expect when I ordered the model but have seen some picture on the net prior to the purchase. When the parcel arrived and get un-boxed, the model looked good with the low sleek lines just as I like it. 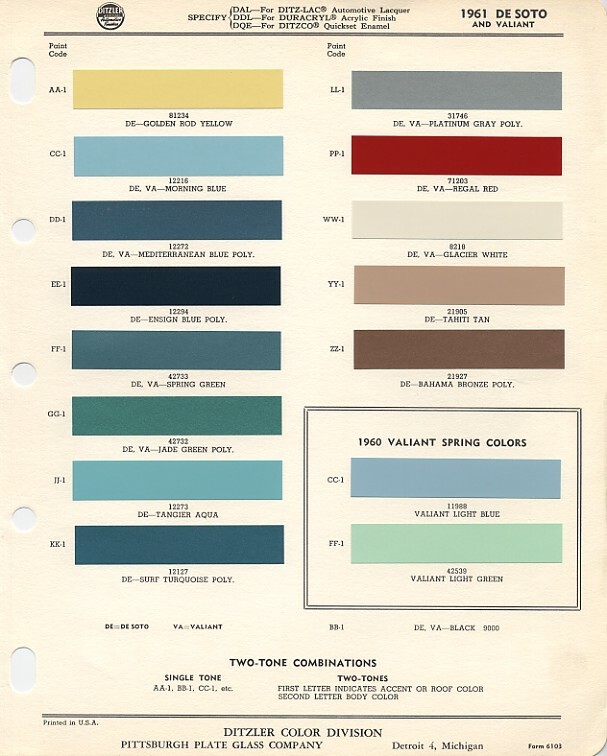 With Yatming you have a “guarantee in success” regarding the paint and prep work. 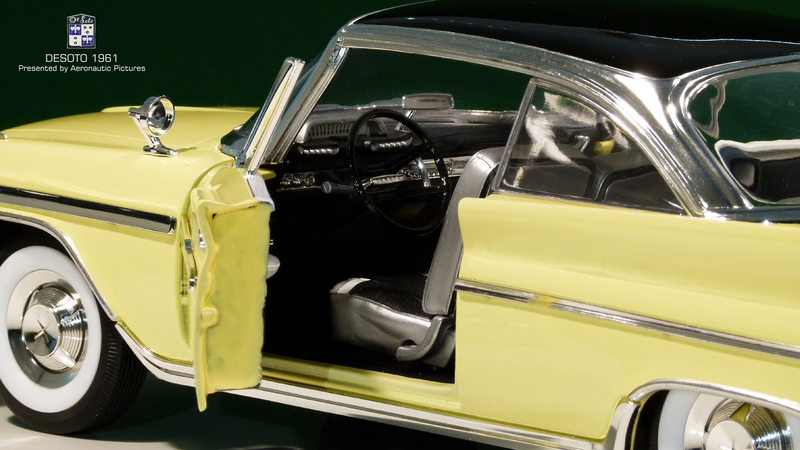 The same can be said about the chrome trim and there attachment – the parts stay were they are placed and all feel secure and solid. 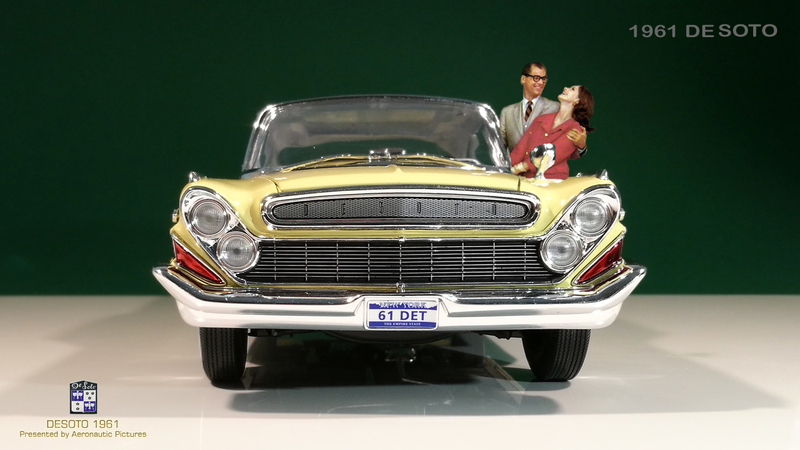 The 1961 DeSoto model is very fine and all seems be in the right place. 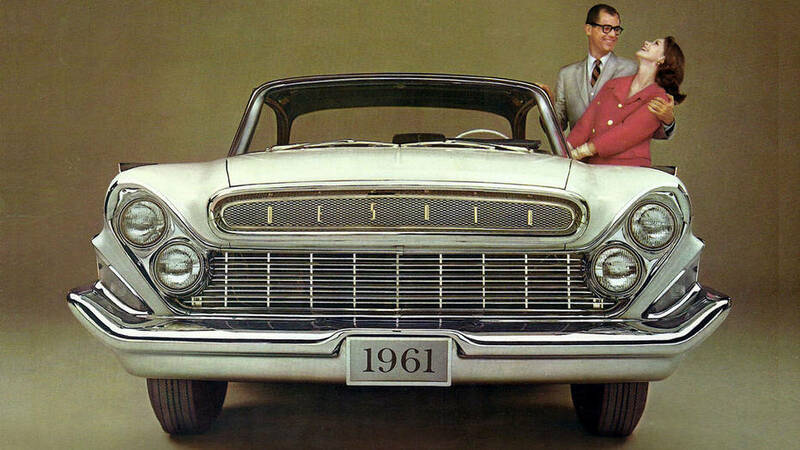 A feature that indicate that they have given the model extra attention is the well done grill on the front of the car. Not only have this two-part grill real metal parts with mesh and name printed on, but also the main grill have black paint in the “holes” – so no extra work is needed here whatsoever! 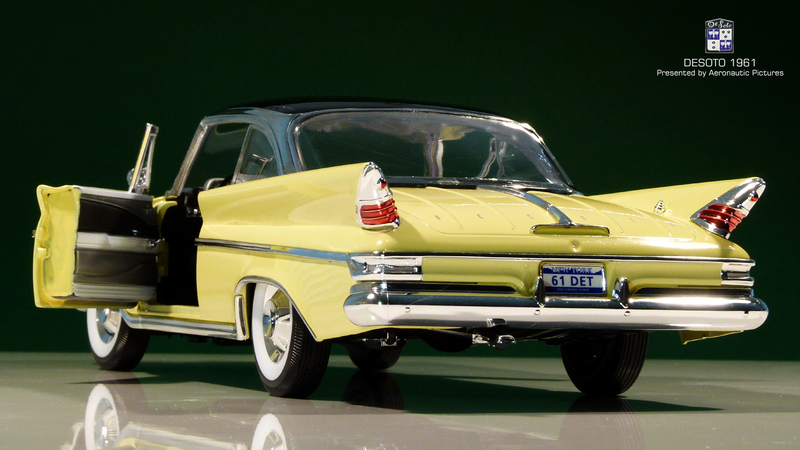 At the rear the deck lid can not be open as usual on some models from Road Signature. If we shall stay a bit on the negative comments about the model here; The backlight lenses is not in real red plastic, instead they are painted chrome parts! I will not be too hard on Road Signature as they very realistic – and at some point when the sun reflexes in the underneath chrome, they look like the bulb is on! As mentioned above; no view to the trunk, but try to open the hood on the front of the car. This is a total different matter, as the motor itself is rather impressive in detail richness. 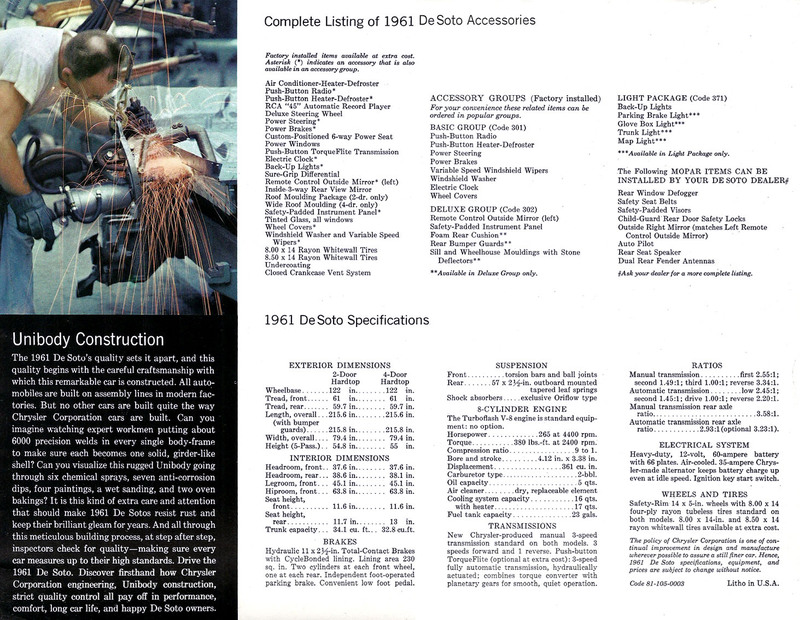 We find wires and a blue washer bag and best of all: non hotrod chrome parts here as seen on older models. The clear plastic parts are as usual good on the model. 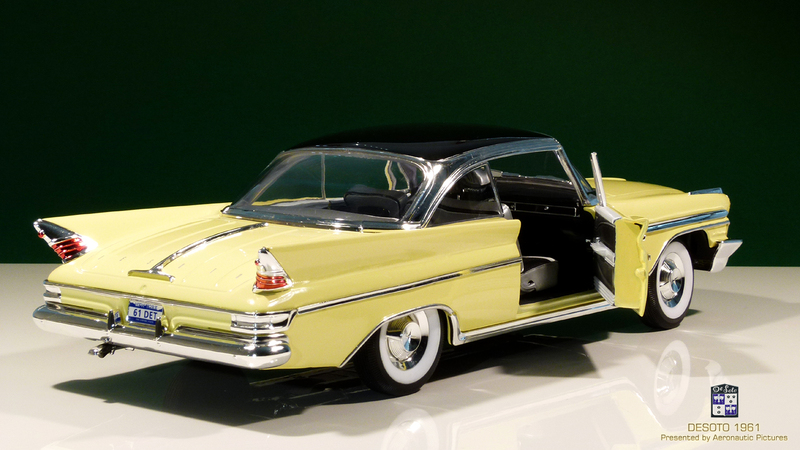 The windows are clear and realistic and up front the headlight lenses look like the real thing. I have kept the best parts to the last section here: Open the doors with the new hinges they operate nicely and are way better that the ordinary dogleg hinges seen on the older models. 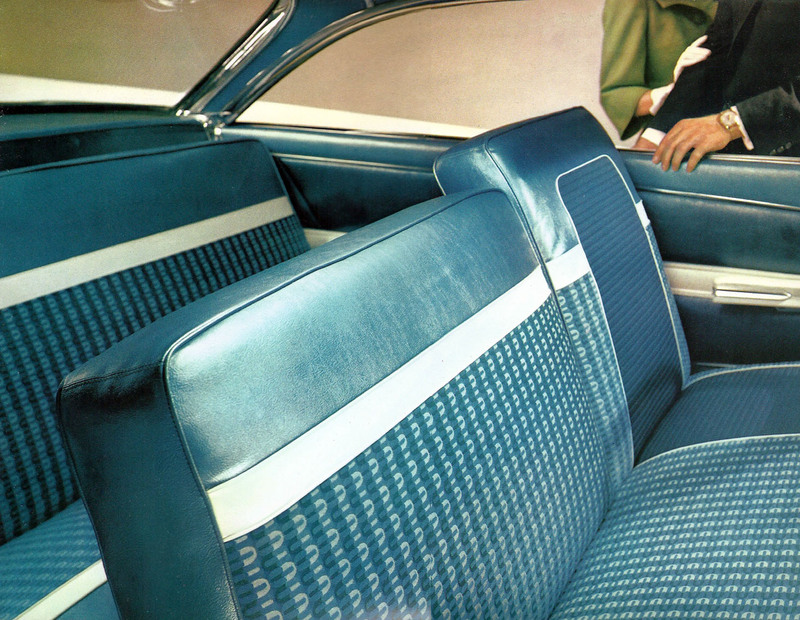 The interior of the DeSoto is in a league by its self. It is just fantastic! 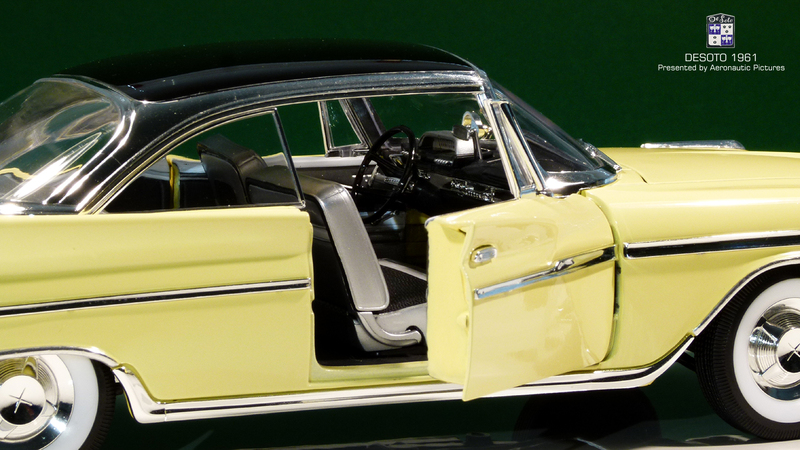 Take a look at the steering wheel with the DeSoto name on it. The silver vinyl seats with the “woven fabric” are to date the best I have seen on a model from Yatming Group. 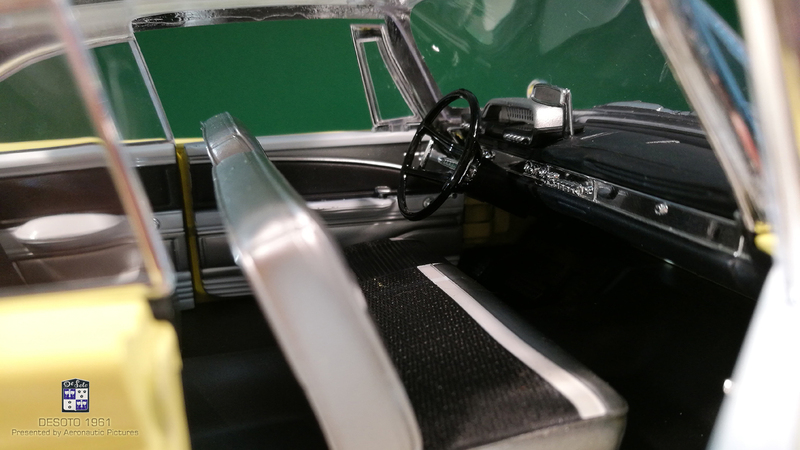 The dashboard with the instrument panel is realistic – just inspect the speedometer and gear bottoms etc. 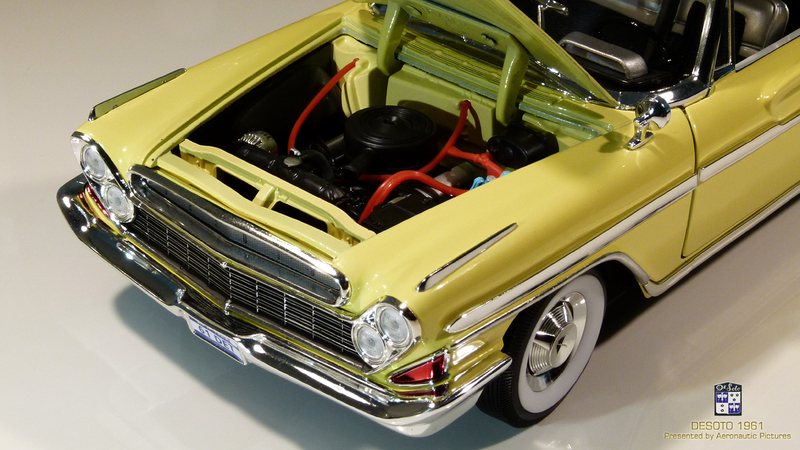 - again one of the best I have seen on a budget model car like this. 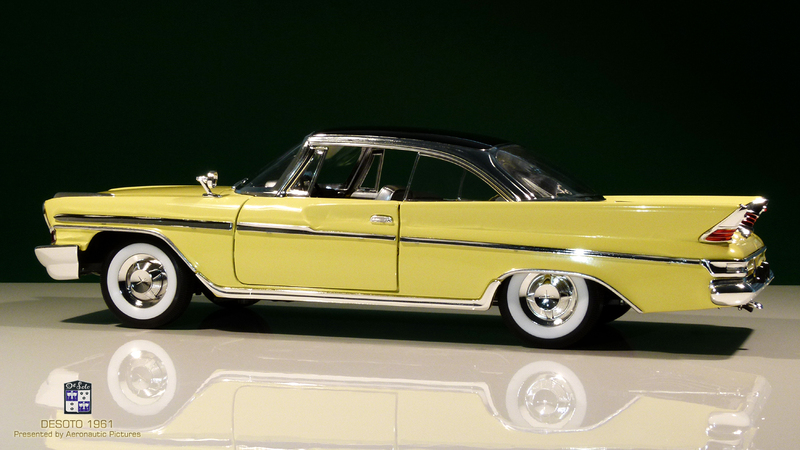 The only work extra I have done on this model is: Yellow paint on the rear side of the doors, and Liquid Chrome on the otherwise silver painted trim around the wheel wells was applied. If we take this into consideration regarding pro and cons – I have to give this model an extra star! 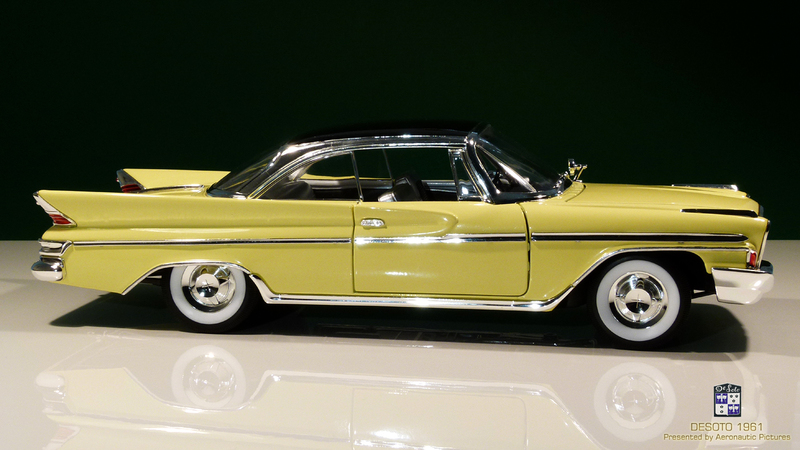 Chrysler named the color "Golden Rod Yellow"
The Desoto was in it last time of existence that they did not named the model! 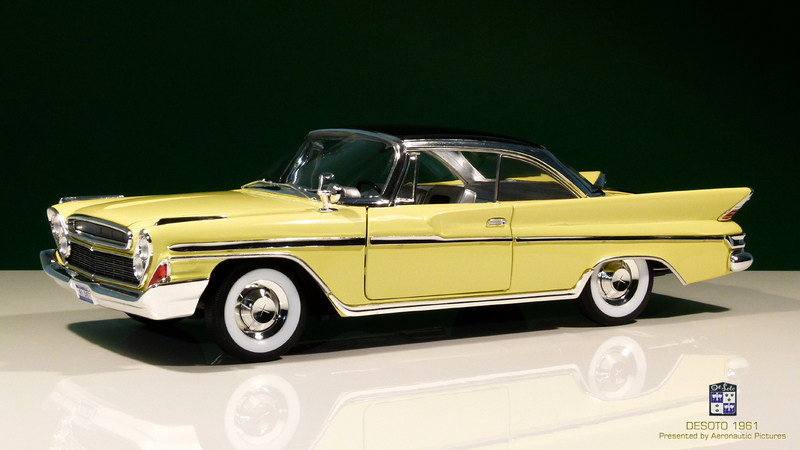 DeSoto (sometimes De Soto) is an American automobile marque that was manufactured and marketed by the DeSoto Division of the Chrysler Corporation from 1928 to the 1961 model year. 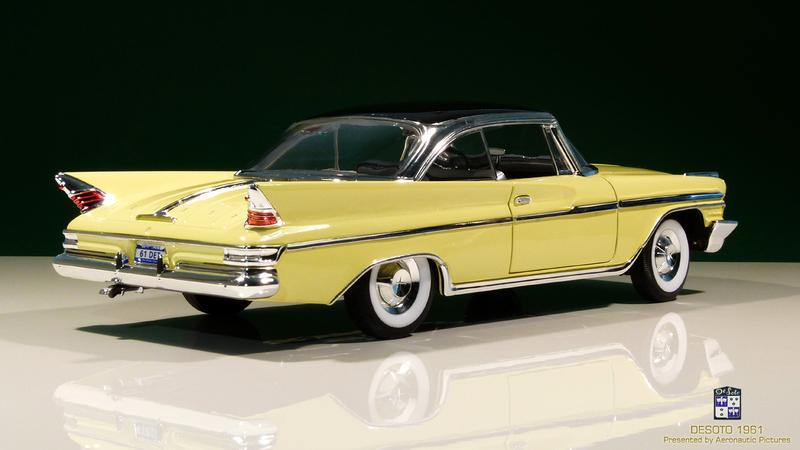 The De Soto marque was officially dropped November 30, 1960, with over two million vehicles built since 1928. 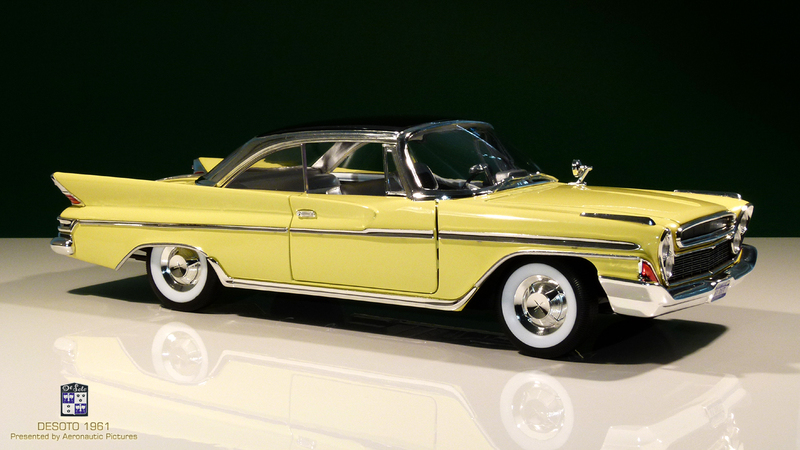 The '61 model wasn't granted the courtesy of a model name. 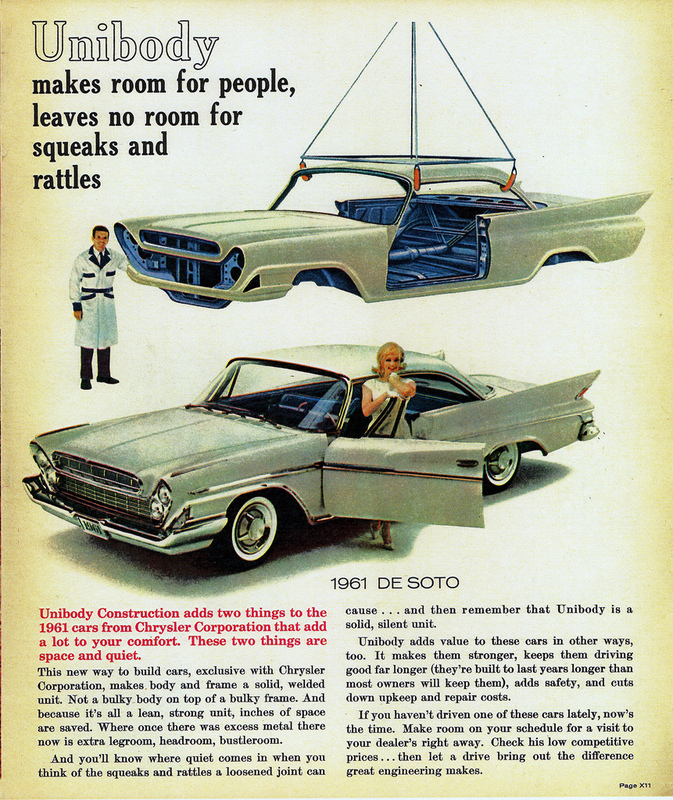 It was simply dubbed DeSoto. 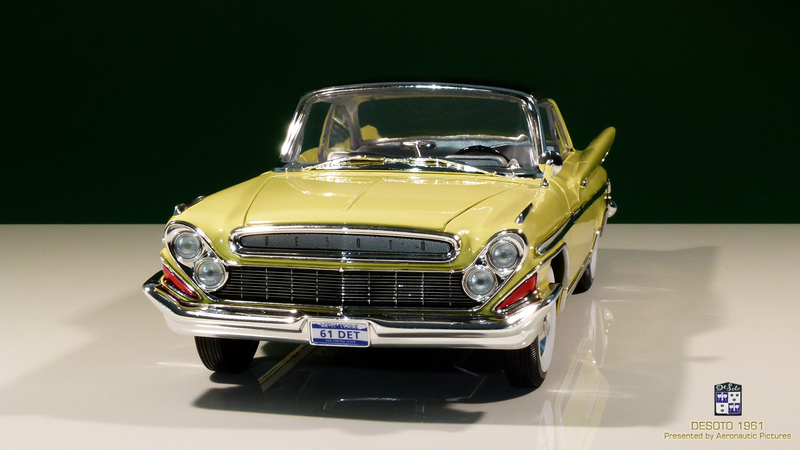 What buyers existed was given a choice of only two body styles - a two door hardtop and a four door hardtop. Both wore full length chrome spears along their sides and shared a uniquely styled front end. 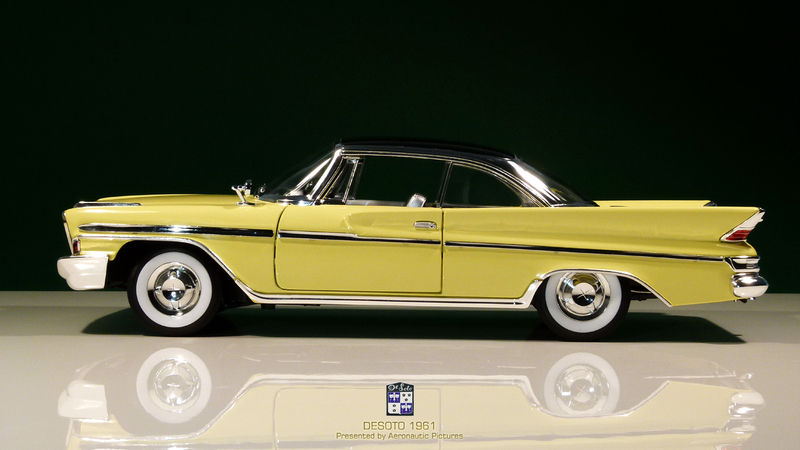 They held little visual link to past DeSotos though the name was prominently displayed in the upper secondary grille and along the trunk lid. 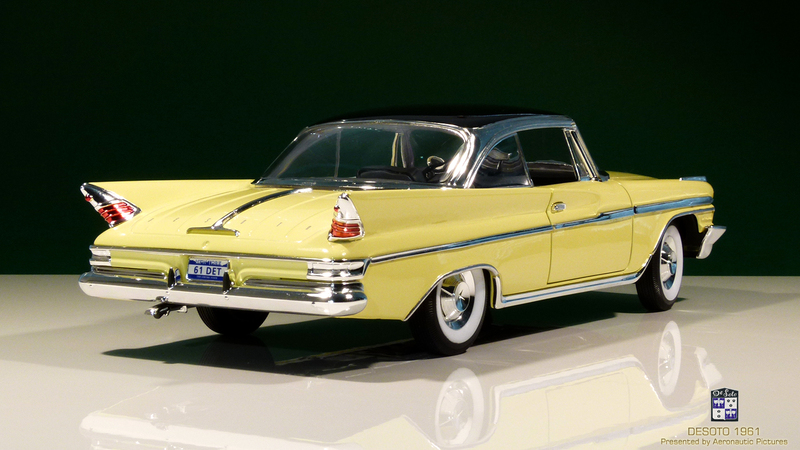 Like the 1960 model before it, the last DeSoto used a 122 inch wheel base, the same span used by full size Dodges. 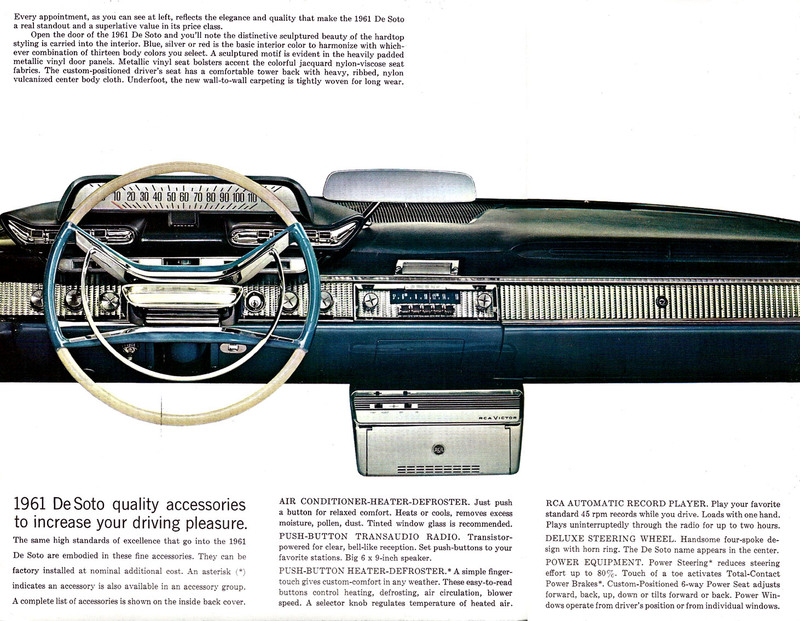 The dash board, with its three tier design and raised speedometer, could be traced back to Dodge. 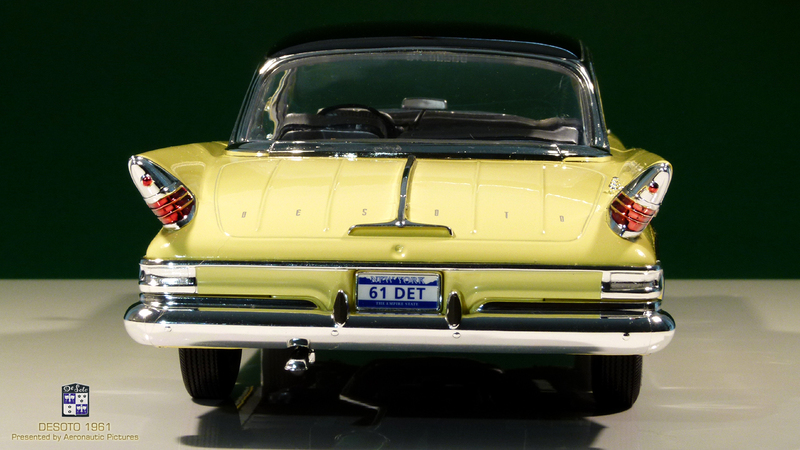 Even the engine, with an uninspiring 265 horses, came from DeSoto's less prestigious sibling. The days of lanky 126 inch wheelbases and sparkling performance were clearly over. 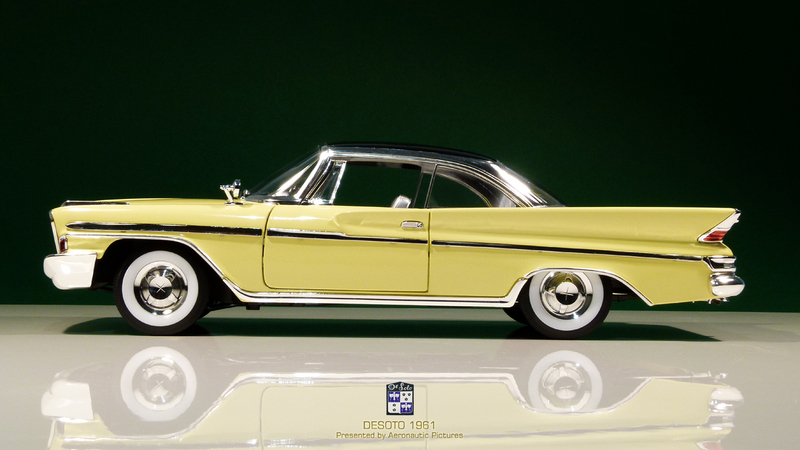 "For 1961, DeSoto proudly presents a fine new car. 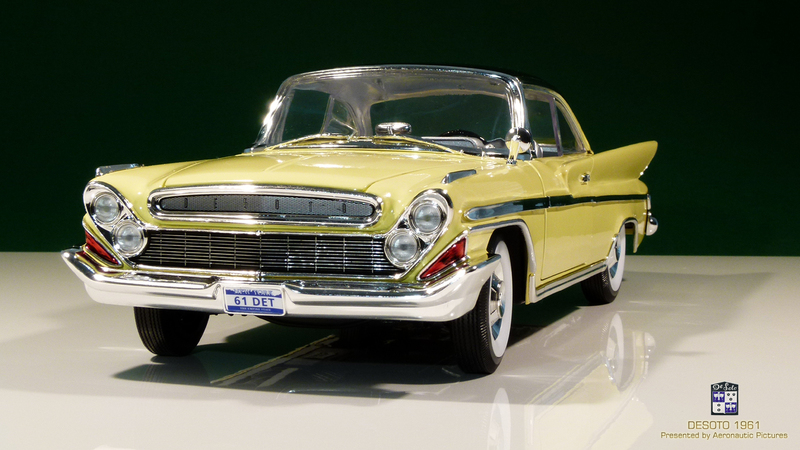 It is a car rich in traditional DeSoto quality, fresh in the way it looks and performs. It puts into your hands the most all-around value in its price class. 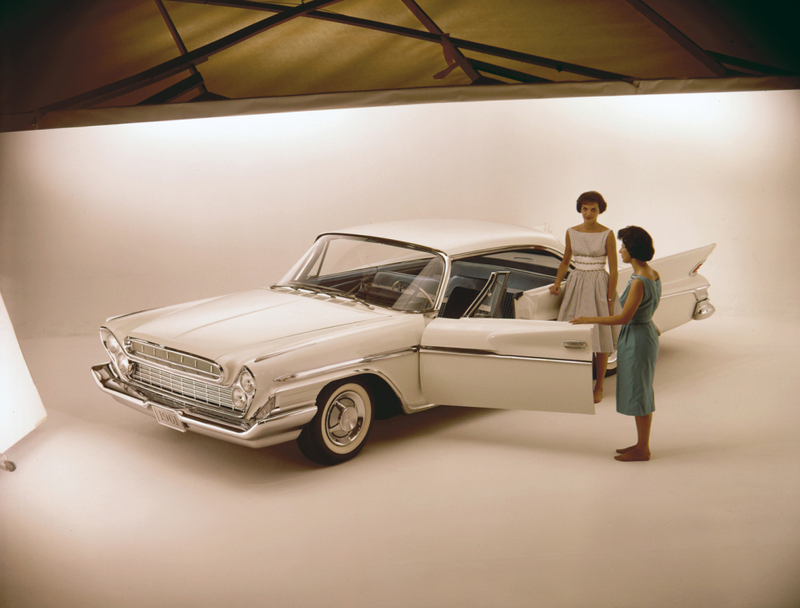 The 1961 DeSoto is not a former middle priced car scaled down in any way to attract the mass of low priced car buyers. Nor is it for those who are willing to pay a premium for a status symbol. 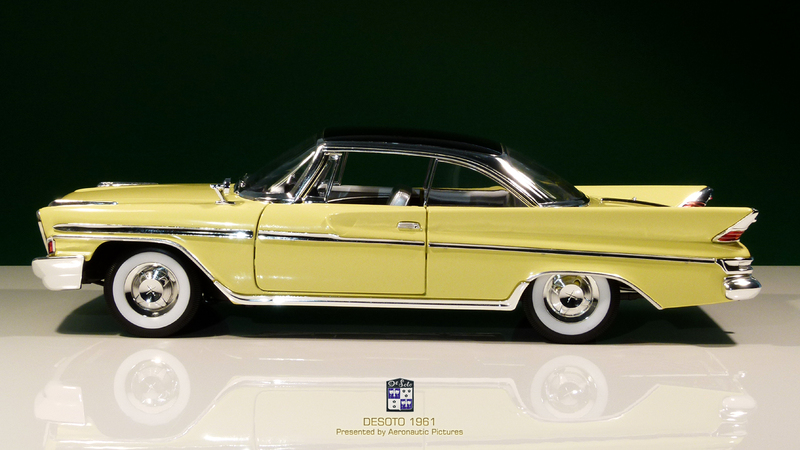 Rather, the 1961 DeSoto has been deliberately designed for a particular kind of person who appreciates the additional roominess, the distinctive refinements and the reassuring "feel" of an automobile in DeSoto's class. It offers all these things, in superior measure, at a price you will find surprisingly low. 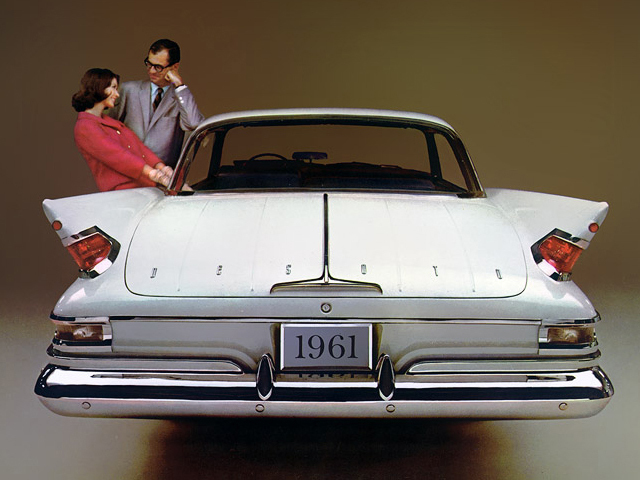 Surely, the 1961 DeSoto has much to offer you. 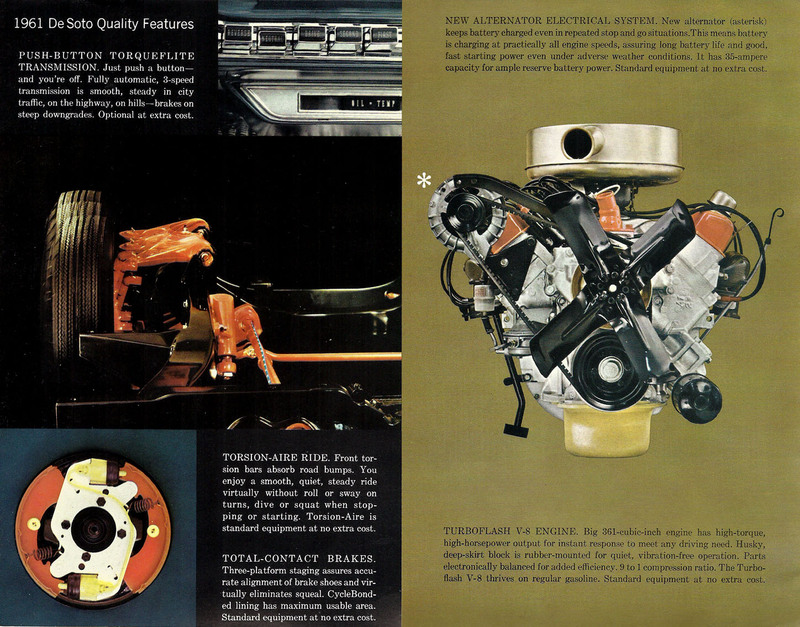 In this brochure, you will find some of the reasons you should look into this new car. 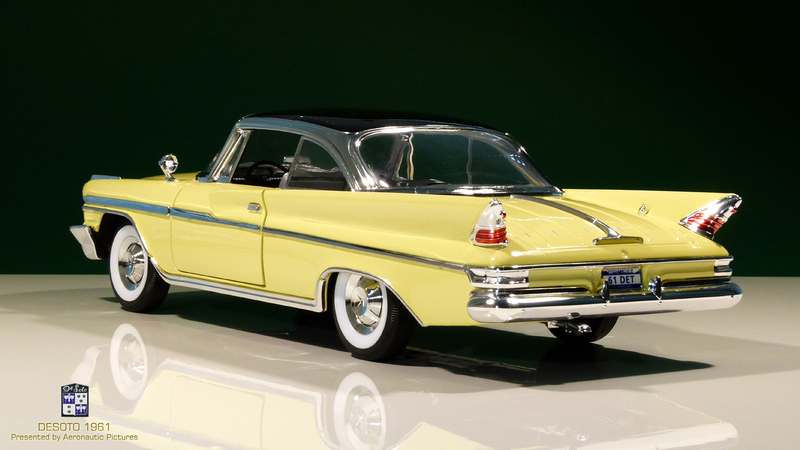 Your Plymouth-DeSoto dealer will show you many more." 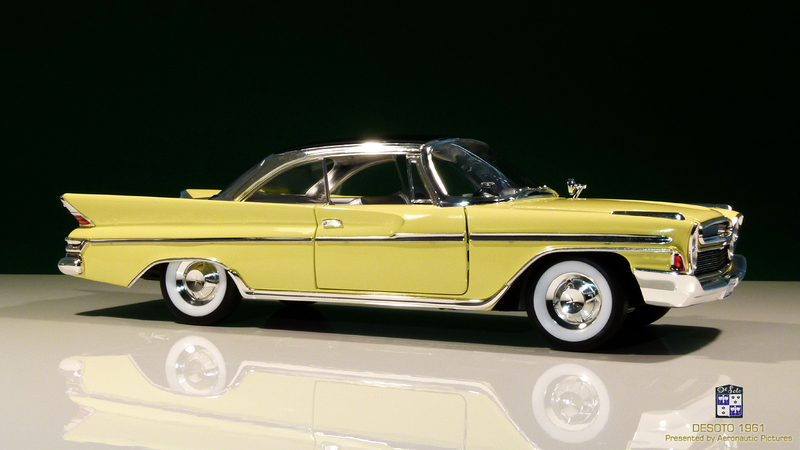 The final decision to discontinue DeSoto was announced on November 30, 1960; just forty-seven days after the 1961 models were introduced. 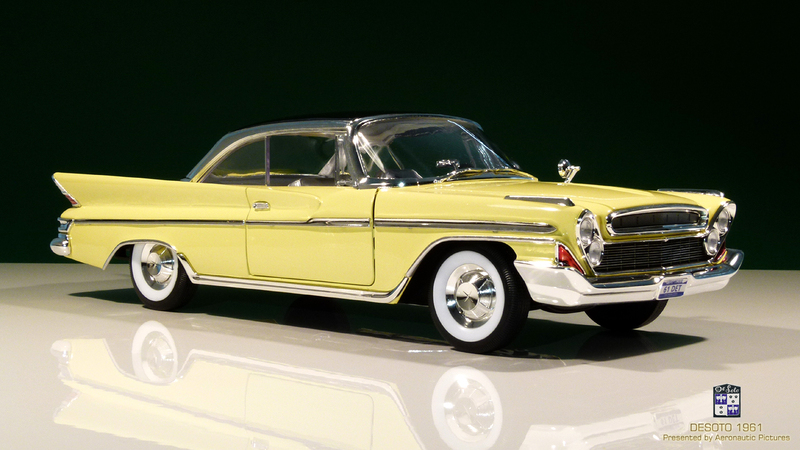 At the time, Chrysler warehouses contained several million dollars in 1961 DeSoto parts, so the company ramped up production in order to use up the stock. 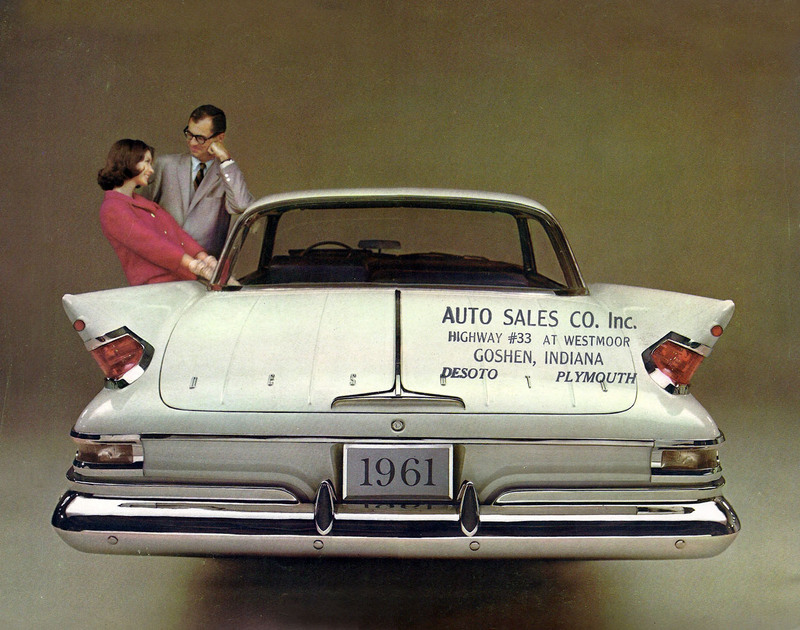 Chrysler and Plymouth dealers, which had been forced to take possession of DeSotos under the terms of their franchise agreements, received no compensation from Chrysler for their unsold DeSotos at the time of the formal announcement. 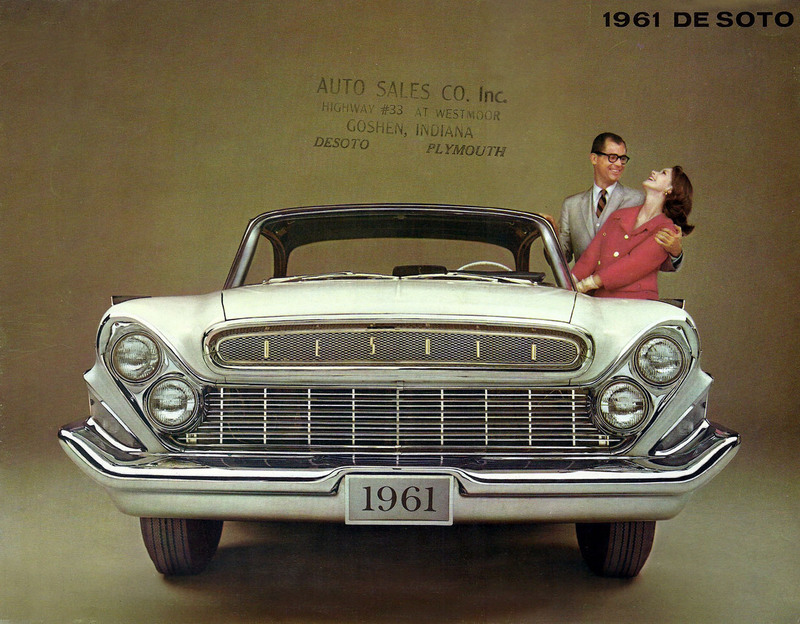 Making matters worse, Chrysler kept shipping the cars through December, many of which were sold at a loss by dealers eager to be rid of them. 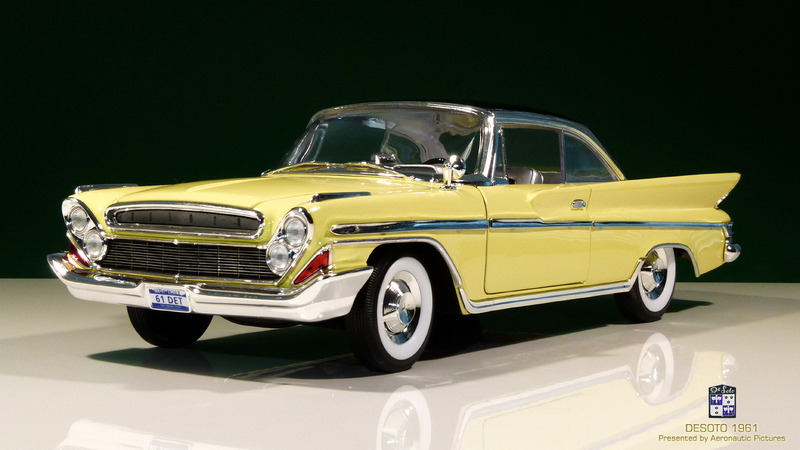 After the parts stock was exhausted, a few outstanding customer orders were filled with Chrysler Windsors. 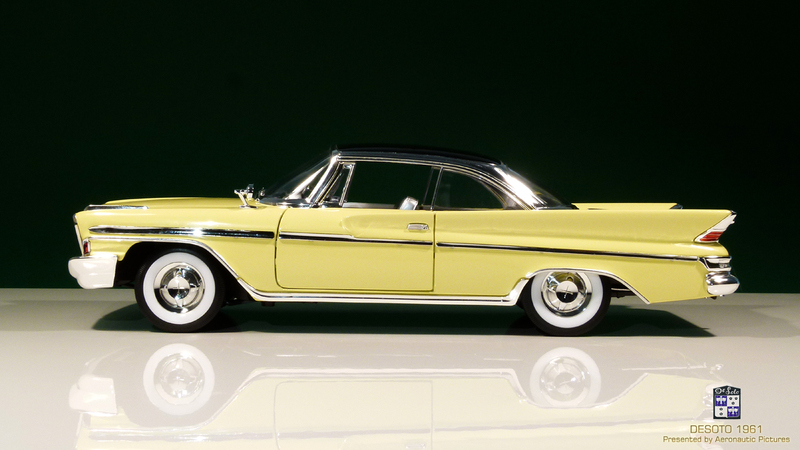 When Chrysler marketing showed that consumers were likelier to buy an entry-level Chrysler than a DeSoto, Chrysler introduced the Chrysler Newport as a 1961 model, selling more than 45,000 units in its first year. 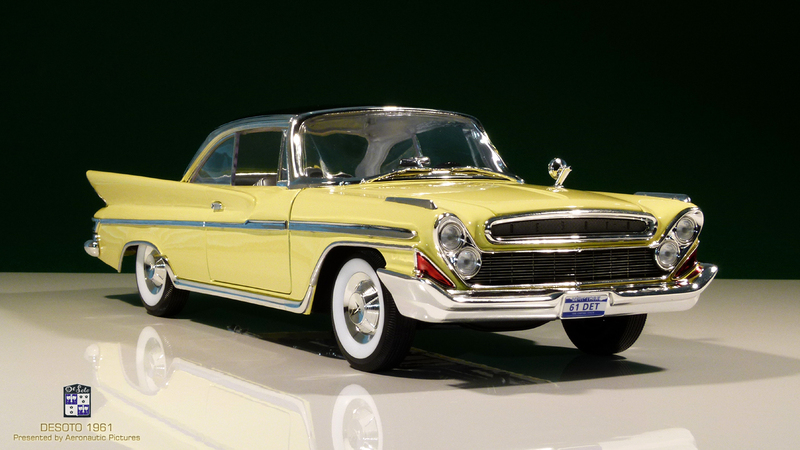 At less than $3,000, the Newport covered the same price range as the 1961 DeSoto, which had sold 3,034 units total. 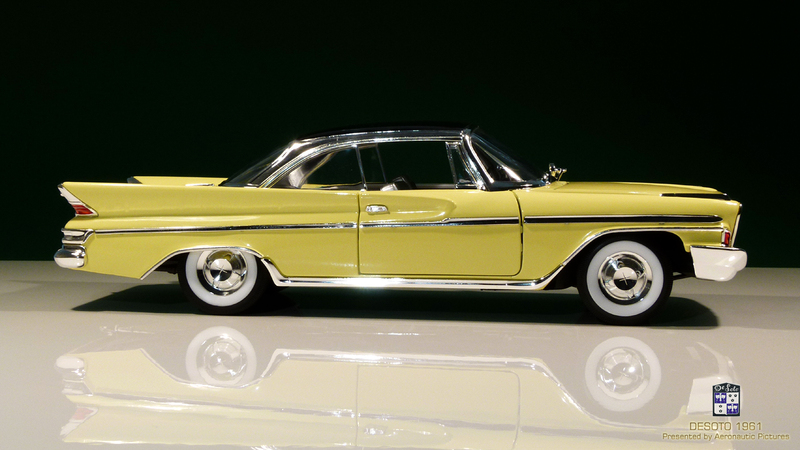 Thus the DeSoto was dropped and replaced by Chrysler Newport. 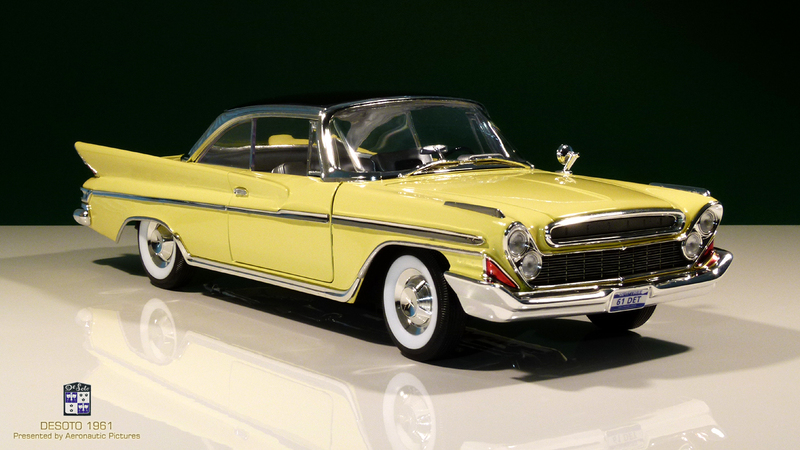 The following year, 1962, Dodge also introduced its DeSoto replacement, the large DeSoto-sized Dodge Custom 880. 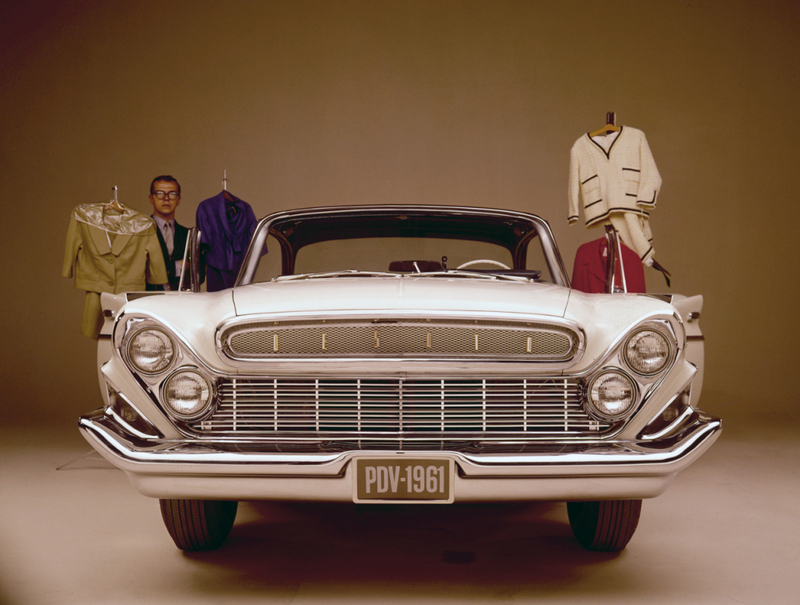 Between these two cars, the Newport, and the Custom 880, the price gap caused by the demise of DeSoto was effectively closed.